It’s a council report talking about the (baffling) decision that council bosses are about to take to move Leeds’ main tourist information centre from the busiest railway station in the north of England to a basement cafe/shop at the city’s Art Gallery. Everyone’s baffled. And just about all the publicity so far is bad. You’ve got a city that’s just had its most significant tourism boost ever … and yet its only tourist information centre (which had some 4,500 people through its doors last Saturday) would apparently do a better job tucked away off the beaten track. The footfall facts are pretty clear: over 25 million people come through the station every year (more if and when HS2 arrives), and only a million and a bit go to the gallery and library area around the planned new location. Hence people’s incredulity (see panels left and above). 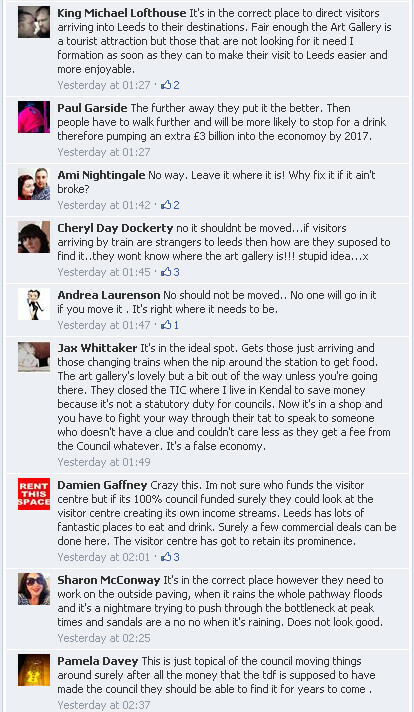 Now the council has come up with its arguments for the move, of course. They’re based on a review that’s just been carried out into the centre’s operation and its future. The findings are summarised in a report that’s set to be rubber-stamped by council bosses at a meeting next Wednesday, 16th July. They say that the service doesn’t need the amount of space it’s currently got, that a new lease on the space they currently rent would be too expensive to take up in November when it falls due, and that finding a different home for the service at the station isn’t the best option. They say that customer demand is moving away from face-to-face contact to online, and that only 40% of the 500,000 people coming through the centre’s doors every year (Leeds is the second busiest centre in the UK) are looking for information. And they say that moving to the cafe/shop would allow them to deliver a better service to customers at the same time as adhering to their policy of putting services into council-owned buildings alongside each other. The trouble is: the arguments aren’t all backed up by local evidence. We don’t know what information they’ve gathered for the review, who they got it from, or how they’ve arrived at their conclusions, in particular with regard to the detailed cost/ benefit analysis of the options they’ve looked at. The review hasn’t been published, just a summary that backs up the decision, so we have to take it on trust that it’s reliable. Nothing new there, you might say. Except that not being able to see the raw data on which a decision like this is made doesn’t sit well with the council’s current attachment to “transparency through open data”. And it means that no-one is in a position to challenge the decision, because no-one has the facts – what facts there are – apart from the council. Who runs tourism in Leeds? One thing we do know, though. 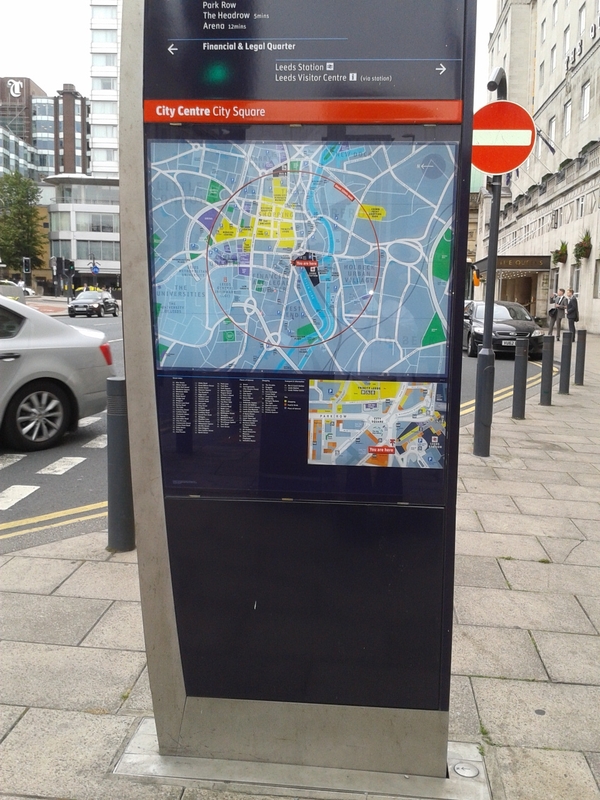 The move marks a significant change in tourism policy in Leeds. Two years ago all of the council’s tourism effort was handed over lock, stock and visitor centre staff to Marketing Leeds, or Leeds and Partners as it’s now called. Now, guess what? Leeds and Partners are handing part of it back. They want shut of the centre. “Leeds & Partners have confirmed that the Leeds Visitor Centre is not a core activity for them,” the report says bluntly. Sorry? 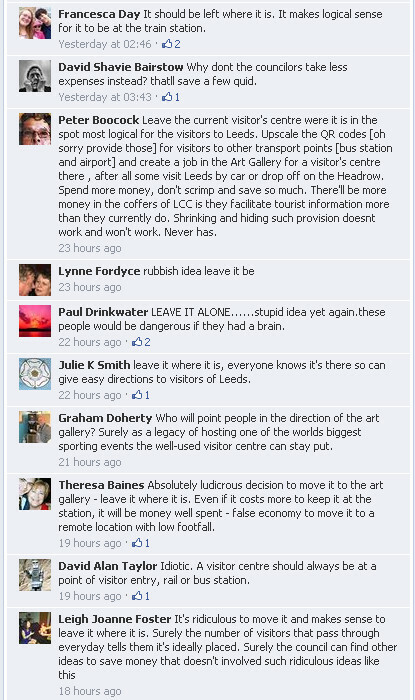 The people who run tourism in Leeds don’t see the city’s tourism information centre as part of what they do? 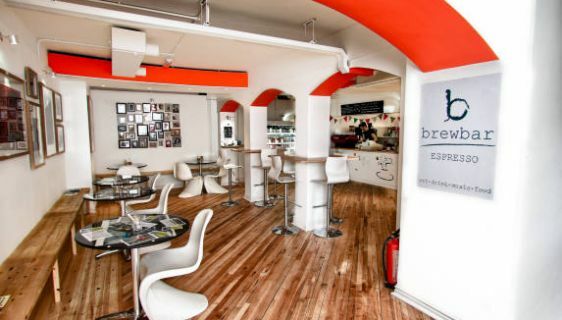 Twelve months after the service has been relocated to the art gallery cafe and shop, they’re planning to review the situation to see if the move has worked. And how will they measure the success of the move or otherwise? “Although it is difficult to define what would constitute success without knowing the preferred option, if the co-location option is agreed then an increase in retail sales in the Art Gallery shop would be a reasonable measure,” the report says. So you measure the success of a tourist information centre by the amount of stuff sold in the shop it happens to be located next to? Worth recalling that it’s only two years ago that council bosses were celebrating the fact that the Visitor Centre had been nominated for a prestigious White Rose Award. “Tourism is such an important part of our local economy, so it’s good to know that our visitor services are being recognised,” Leisure Service chief Cllr Adam Ogilvie said at the time. 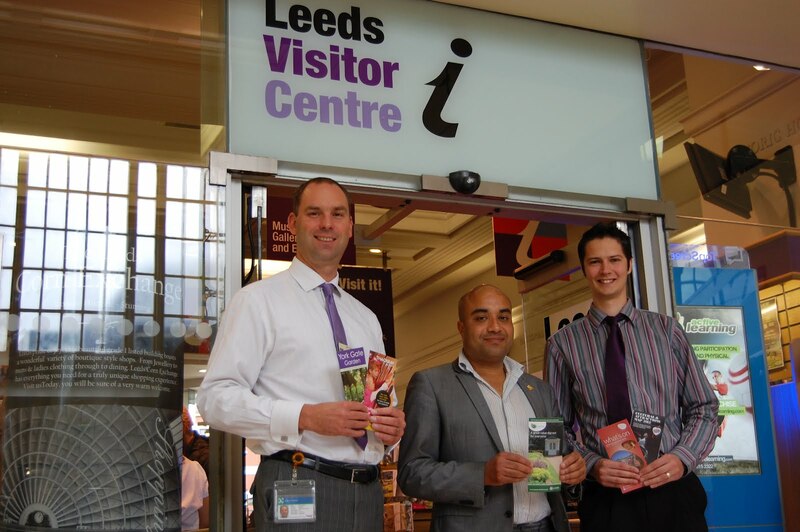 “Leeds Visitor Centre is often the first point of contact for visitors arriving in the city and this nomination demonstrates the importance of ensuring that each and every visitor is able to make the most out of their visit. This entry was posted in Uncategorized and tagged leeds, leeds and partners, leeds city council, leeds railway station, leeds visitor centre, tourism. Bookmark the permalink. Could it be the retail targets for the gallery shop have failed to live up to the usual fiction of the business plan and are projected to drop embarrassingly off a cliff? Quick, put the tourism centre in there for a couple of years. Yep. Almost definitely. Bless ’em. Pure and simple – they cannot afford the new lease and can accommodate it much more cheaply in their own existing building. Given government cuts to local council funding luxuries like plush larger space in a third party leased space are unaffordable. Visitor numbers will drop but what can they do? If it were pure and simple it’d be fine. But it isn’t. A relatively cheap (£145,000 p.a.) but very successful service is getting what is probably just a stay of execution at a time when it seems to have been showing its real worth. If all the facts behind the decision (customer behaviour data, on-site sales, face-to-face vs online etc) were presented and a detailed analysis of the other options given, it’d be easier to understand and accept it. Until then it’s difficult not to feel that it’s just convenient, probably prompted by Leeds and Partners’ wish to get rid. Pingback: » Where’s the Visitor Centre?